Workers engaged in trade union action should consider the rights of the public with the same attitude they have towards their own privileges, President Maithripala Sirisena said yesterday at a ceremony held at Viharamahadevi Park in Colombo. “It is not the Government which suffers but the people of the country,” he said while speaking at a function organised by Sri Lanka Ayurvedic Drugs Corporation and the Sri Lanka Army to distribute 100,000 herbal plants. He also highlighted that public services such as transport and health were not used by the wealthy but by underprivileged people in the country. 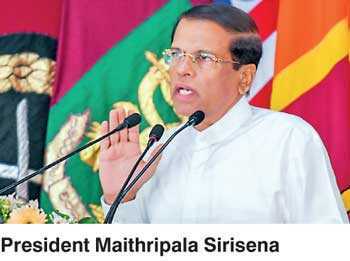 President Sirisena regretted the inconvenience and stress that candidates of the G.C.E. A/L Examination had been put through due to the railway strike. President Sirisena said that the Government was available to hold discussions at any time to find solutions to their issues and that the present government never used guns against protesters unlike the previous one. Therefore, the President requested the trade unions, including railway workers and the doctors, who are ready for strikes, to take steps to solve their problems in an intelligent and humane manner without causing hardships to the innocent people of the country. This program to distribute herbal plants, named ‘Punarudaya Dina 60 Meheyuma’, is expected to plant 100,000 plants at different army camps in the country. The President pointed out that the Government had taken steps to increase the current forest cover from 28% to 32% and added that the project launched today would be of massive importance when taking this program forward. The President mentioned that a huge environmental revolution was planned with the support of the armed forces to increase the forest cover and eliminate drugs. President Sirisena reiterated that the decision taken by the Government to reintroduce the death penalty to those who are guilty of serious drug-related offences while in prison will be continued for the sake of the future of the country and the nation. The President handed over the first herbal plant to Army Commander Lieutenant General Mahesh Senanayake to start the project. The President also planted a sandalwood plant in Viharamahadevi Park. Minister Rajitha Senaratne, Ayurvedic Drugs Corporation Chairmen Lal Samarasighe, Chief Administrative Officer Sri Lanka Army Major General Shavendra Silva and Army Agriculture Director Brigadier Buwanaka Gunerathna were present at this event.